There was something almost solemn in Effie's tone and expression. "Gabie," she said slowly, "you're the first man that's ever asked me to marry him." "That goes double," answered Gabe. "You're just twenty years late," she said. All of those ladies who end their conversation with you by wearily suggesting that you go down to the basement to find what you seek, do not receive a meager seven dollars a week as a reward for their efforts. Neither are they all obliged to climb five weary flights of stairs to reach the dismal little court room which is their home, and there are several who need not walk thirty-three blocks to save carfare, only to spend wretched evenings washing out handkerchiefs and stockings in the cracked little washbowl, while one ear is cocked for the stealthy tread of the Lady Who Objects. The earnest compiler of working girls' budgets would pass Effie Bauer hurriedly by. Effie's budget bulged here and there with such pathetic items as hand-embroidered blouses, thick club steaks, and parquet tickets for Maude Adams. That you may visualize her at once I may say that Effie looked twenty-four--from the rear (all women do in these days of girlish simplicity in hats and tailor-mades); her skirts never sagged, her shirtwaists were marvels of plainness and fit, and her switch had cost her sixteen dollars, wholesale (a lady friend in the business). Oh, there was nothing tragic about Effie. She had a plump, assured style, a keen blue eye, a gift of repartee, and a way of doing her hair so that the gray at the sides scarcely showed at all. Also a knowledge of corsets that had placed her at the buying end of that important department at Spiegel's. Effie knew to the minute when coral beads went out and pearl beads came in, and just by looking at her blouses you could tell when Cluny died and Irish was born. Meeting Effie on the street, you would have put her down as one of the many well-dressed, prosperous-looking women shoppers--if you hadn't looked at her feet. Veteran clerks and policemen cannot disguise their feet. Effie Bauer's reason for not marrying when a girl was the same as that of most of the capable, wise-eyed, good-looking women one finds at the head of departments. She had not had a chance. If Effie had been as attractive at twenty as she was at--there, we won't betray confidences. 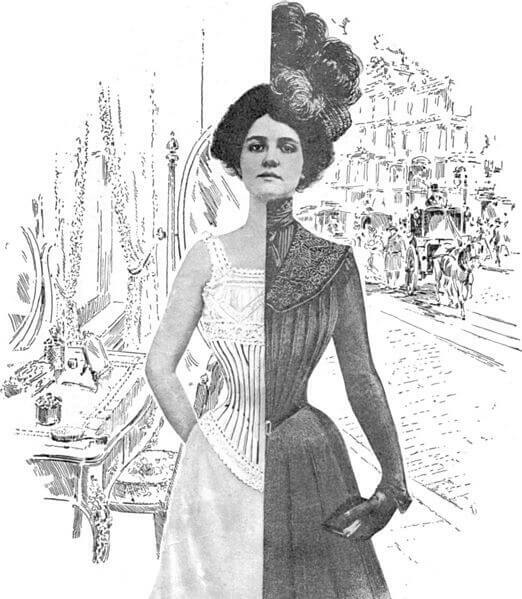 Still, it is certain that if Effie had been as attractive when a young girl as she was when an old girl, she never would have been an old girl and head of Spiegel's corset department at a salary of something very comfortably over one hundred and twenty-five a month (and commissions). Effie had improved with the years, and ripened with experience. She knew her value. At twenty she had been pale, anaemic and bony, with a startled-faun manner and bad teeth. Years of saleswomanship had broadened her, mentally and physically, until she possessed a wide and varied knowledge of that great and diversified subject known as human nature. She knew human nature all the way from the fifty- nine-cent girdles to the twenty-five-dollar made-to-orders. And if the years had brought, among other things, a certain hardness about the jaw and a line or two at the corners of the eyes, it was not surprising. You can't rub up against the sharp edges of this world and expect to come out without a scratch or so. "l was out with my friend, Mr. Marks, last evening. We went to Rector's after the show. Oh, well, it takes a New Yorker to know how. Honestly, I feel like a queen when I go out with him. H'm? Oh, nothing like that, girlie. I never could see that marriage thing. Just good friends." Gabe had been coming to Chicago four times a year for six years. Six times four are twenty-four. And one is twenty-five. Gabe's last visit made the twenty-fifth. "Well, Effie," Gabe said when the evening's entertainment had reached the restaurant stage, "this is our twenty-fifth anniversary. It's our silver wedding, without the silver and the wedding. We'll have a bottle of champagne. That makes it almost legal. And then suppose we finish up by having the wedding. The silver can be omitted." Effie had been humming with the orchestra, holding a lobster claw in one hand and wielding the little two-pronged fork with the other. She dropped claw, fork, and popular air to stare open-mouthed at Gabe. Then a slow, uncertain smile crept about her lips, although her eyes were still unsmiling. "Stop your joking, Gabie," she said. "Some day you'll say those things to the wrong lady, and then you'll have a breach-of-promise suit on your hands." "This ain't no joke, Effie," Gabe had replied. "Not with me it ain't. As long as my mother selig lived I wouldn't ever marry a Goy. It would have broken her heart. I was a good son to her, and good sons make good husbands, they say. Well, Effie, you want to try it out?" There was something almost solemn in Effie's tone and expression. "Gabie," she said slowly, "you're the first man that's ever asked me to marry him." "That goes double," answered Gabe. "Thanks," said Effie. "That makes it all the nicer." "Then---- Gabe's face was radiant. But Effie shook her head quickly. "You're just twenty years late," she said. "Late!" expostulated Gabe. "I ain't no dead one yet." Effie pushed her plate away with a little air of decision, folded her plump arms on the table, and, leaning forward, looked Gabe I. Marks squarely in the eyes. "Gabie," she said gently, "I'll bet you haven't got a hundred dollars in the bank----"
"Wait a minute. I know you boys on the road. Besides your diamond scarf pin and your ring and watch, have you got a cent over your salary? Nix. You carry just about enough insurance to bury you, don't you? You're fifty years old if you're a minute, Gabie, and if I ain't mistaken you'd have a pretty hard time of it getting ten thousand dollars' insurance after the doctors got through with you. Twenty-five years of pinochle and poker and the fat of the land haven't added up any bumps in the old stocking under the mattress." "Say, looka here," objected Gabe, more red-faced than usual, "I didn't know was proposing to no Senatorial investigating committee. Say, you talk about them foreign noblemen being mercenary! Why, they ain't in it with you girls to-day. A feller is got to propose to you with his bank book in one hand and a bunch of life-insurance policies in the other. You're right; I ain't saved much. But Ma selig always had everything she wanted. Say, when a man marries it's different. He begins to save." "There!" said Effie quickly. "That's just it. Twenty years ago I'd have been glad and willing to start like that, saving and scrimping and loving a man, and looking forward to the time when four figures showed up in the bank account where but three bloomed before. I've got what they call the home instinct. Give me a yard or so of cretonne, and a photo of my married sister down in Iowa, and I can make even a boarding-house inside bedroom look like a place where a human being could live. If I had been as wise at twenty as I am now, Gabie, I could have married any man I pleased. But I was what they call capable. And men aren't marrying capable girls. They pick little yellow-headed, blue-eyed idiots that don't know a lamb stew from a soup bone when they see it. Well, Mr. Man didn't show up, and I started in to clerk at six per. I'm earning as much as you are now. More. Now, don't misunderstand me, Gabe. I'm not throwing bouquets at myself. I'm not that kind of a girl. But I could sell a style 743 Slimshape to the Venus de Milo herself. The Lord knows she needed one, with those hips of hers. I worked my way up, alone. I'm used to it. I like the excitement down at the store. I'm used to luxuries. I guess if I was a man I'd be the kind thy call a good provider--the kind that opens wine every time there's half an excuse for it, and when he dies his widow has to take in boarders. And, Gabe, after you've worn tailored suits every year for a dozen years, you can't go back to twenty-five-dollar ready-mades and be happy." "You could if you loved a man," said Gabe stubbornly. The hard lines around the jaw and the experienced lines about the eyes seemed suddenly to stand out on Effie's face. "Love's young dream is all right. But you've reached the age when you let your cigar ash dribble down onto your vest. Now me, I've got a kimono nature but a straight-front job, and it's kept me young. Young! I've got to be. That's my stock in trade. You see, Gabie, we're just twenty years late, both of us. They're not going to boost your salary. These days they're looking for kids on the road--live wires, with a lot of nerve and a quick come-back. They don't want old-timers. Why, say, Gabie, if I was to tell you what I spend in face powder and toilette water and hairpins alone, you'd think I'd made a mistake and given you the butcher bill instead. And I'm no professional beauty, either. Only it takes money to look cleaned and pressed in this town." In the seclusion of the cafe corner, Gabe laid one plump, highly manicured hand on Effie's smooth arm. "You wouldn't need to stay young for me, Effie. I like you just as you are, with out the powder, or the toilette water, or the hair-pins." His red, good-natured face had an expression upon it that was touchingly near patient resignation as he looked up into Effie's sparkling countenance. "You never looked so good to me as you do this minute, old girl. And if the day comes when you get lonesome--or change your mind--or----"
Effie shook her head, and started to draw on her long white gloves. "I guess I haven't refused you the way the dames in the novels do it. Maybe it's because I've had so little practice. But I want to say this, Gabe. Thank God I don't have to die knowing that no man ever wanted me to be his wife. Honestly, I'm that grateful that I'd marry you in a minute if I didn't like you so well." "I'll be back in three months, like always," was all that Gabe said. "I ain't going to write. When I get here we'll just take in a show, and the younger you look the better I'll like it." But on the occasion of Gabe's spring trip he encountered a statuesque blonde person where Effie had been wont to reign. "Miss--er Bauer out of town?" The statue melted a trifle in the sunshine of Gabe's ingratiating smile. "Miss Bauer's ill," the statue informed him, using a heavy Eastern accent. "Anything I can do for you? I'm taking her place." "Why--ah--not exactly; no," said Gabe. "Just a temporary indisposition, I suppose?" "Well, you wouldn't hardly call it that, seeing that she's been sick with typhoid for seven weeks." "While I'm not in the habit of asking gentlemen their names, I'd like to inquire if yours happens to be Marks--Gabe I. Marks?" "Sure," said Gabe. "That's me." "Miss Bauer's nurse telephones down last week that if a gentleman named Marks--Gabe I. Marks--drops in and inquires for Miss Bauer, I'm to tell him that she's changed her mind." On the way from Spiegel's corset department to the car, Gabe stopped only for a bunch of violets. Effie's apartment house reached, he sent up his card, the violets, and a message that the gentleman was waiting. There came back a reply that sent Gabie up before the violets were relieved of their first layer of tissue paper. Effie was sitting in a deep chair by the window, a flowered quilt bunched about her shoulders, her feet in gray knitted bedroom slippers. She looked every minute of her age, and she knew it, and didn't care. The hand that she held out to Gabe was a limp, white, fleshless thing that seemed to bear no relation to the plump, firm member that Gabe had pressed on so many previous occasions. "You're looking--great!" he stammered. "Great! Nobody'd believe you'd been sick a minute. Guess you've just been stalling for a beauty rest, what?" Effie smiled a tired little smile, and shook her head slowly. "You're a good kid, Gabie, to lie like that just to make me feel good. But my nurse left yesterday and I had my first real squint at myself in the mirror. She wouldn't let me look while she was here. After what I saw staring back at me from that glass a whole ballroom full of French courtiers whispering sweet nothings in my ear couldn't make me believe that I look like anything but a hunk of Roquefort, green spots included. When I think of how my clothes won't fit it makes me shiver." "Oh, you'll soon be back at the store as good as new. They fatten up something wonderful after typhoid. Why, I had a friend----"
"Did you get my message?" interrupted Effie. "I was only talking to hide my nervousness," said Gabe, and started forward. But Effie waved him away. "Sit down," she said. "I've got something to say." She looked thoughtfully down at one shining finger nail. Her lower lip was caught between her teeth. When she looked up again her eyes were swimming in tears. Gabe started forward again. Again Effie waved him away. "It's all right, Gabie. I don't blubber as a rule. This fever leaves you as weak as a rag, and ready to cry if any one says `Boo!' I've been doing some high-pressure thinking since nursie left. Had plenty of time to do it in, sitting here by this window all day. My land! I never knew there was so much time. There's been days when I haven't talked to a soul, except the nurse and the chambermaid. Lonesome! Say, the amount of petting I could stand would surprise you. Of course, my nurse was a perfectly good nurse--at twenty-five per. But I was just a case to her. You can't expect a nurse to ooze sympathy over an old maid with the fever. I tell you I was dying to have some one say `Sh-sh-sh!' when there was a noise, just to show they were interested. Whenever I'd moan the nurse would come over and stick a thermometer in my mouth and write something down on a chart. The boys and girls at the store sent flowers. They'd have done the same if I'd died. When the fever broke I just used to lie there and dream, not feeling anything in particular, and not caring much whether it was day or night. Know what I mean?" Gabie shook a sympathetic head. There was a little silence. Then Effie went on. "I used to think I was pretty smart, earning my own good living, dressing as well as the next one, and able to spend my vacation in Atlantic City if I wanted to. I didn't know I was missing anything. But while I was sick I got to wishing that there was somebody that belonged to me. Somebody to worry about me, and to sit up nights--somebody that just naturally felt they had to come tiptoeing into my room every three or four minutes to see if I was sleeping, or had enough covers on, or wanted a drink, or something. I got to thinking what it would have been like if I had a husband and a--home. You'll think I'm daffy, maybe." Gabie took Effie's limp white hand in his, and stroked it gently. Effie's face was turned away from him, toward the noisy street. "`I know it,' he'd say, rubbing his cheek up against mine. "And then he'd pound off down the hall to wash up, and I'd shut my eyes, and smile to myself, and everything would be all right, because he was home." There was a long silence. Effie's eyes were closed. But two great tears stole out from beneath each lid and coursed their slow way down her thin cheeks. She did not raise her hand to wipe them away. Gabie's other hand reached over and met the one that already clasped Effie's. "Effie," he said, in a voice that was as hoarse as it was gentle. "I shouldn't wonder," replied Effie, opening her eyes. "No, don't kiss me. You might catch something. But say, reach up and smooth my hair away from my forehead, will you, and call me a couple of fool names. I don't care how clumsy you are about it. I could stand an awful fuss being made over me, without being spoiled any." Three weeks later Effie was back at the store. Her skirt didn't fit in the back, and the little hollow places in her cheeks did not take the customary dash of rouge as well as when they had been plumper. She held a little impromptu reception that extended down as far as the lingeries and up as far as the rugs. The old sparkle came back to Effie's eye. The old assurance and vigor seemed to return. By the time that Miss Weinstein, of the French lingeries, arrived, breathless, to greet her Effie was herself again. "Well, if you're not a sight for sore eyes, dearie," exclaimed Miss Weinstein. "My goodness, how grand and thin you are! I'd be willing to take a course in typhoid myself, if I thought I could lose twenty-five pounds." "I haven't a rag that fits me," Effie announced proudly. Miss Weinstein lowered her voice discreetly. "Dearie, can you come down to my department for a minute? We're going to have a sale on imported lawnjerie blouses, slightly soiled, from nine to eleven to-morrow. There's one you positively must see. Hand-embroidered, Irish motifs, and eyeleted from soup to nuts, and only eight-fifty." "I've got a fine chance of buying hand-made waists, no matter how slightly soiled," Effie made answer, "with a doctor and nurse's bill as long as your arm." "Oh, run along!" scoffed Miss Weinstein. "A person would think you had a husband to get a grouch every time you get reckless to the extent of a new waist. You're your own boss. And you know your credit's good. Honestly, it would be a shame to let this chance slip. You're not getting tight in your old age, are you?" "Then come on," urged Miss Weinstein energetically. "And be thankful you haven't got a man to raise the dickens when the bill comes in." "Do you mean that?" asked Effie slowly, fixing Miss Weinstein with a thoughtful eye. "Surest thing you know. Say, girlie, let's go over to Klein's for lunch this noon. They have pot roast with potato pfannkuchen on Tuesdays, and we can split an order between us." "Hold that waist till to-morrow, will you?" said Effie. "I've made an arrangement with a--friend that might make new clothes impossible just now. But I'm going to wire my party that the arrangement is all off. I've changed my mind. I ought to get an answer to-morrow. Did you say it was a thirty-six?" Add One of the Old Girls to your own personal library.